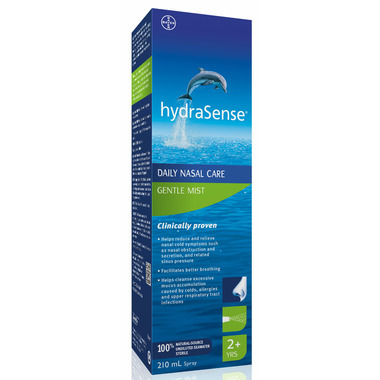 hydraSense Daily Nasal Care Gentle Mist nasal spray is designed for sensitive noses and first-time users who are experiencing seasonal or year-round allergies or a cold. It can also be used when the air is dry due to air conditioning or heating and you simply want to breathe better. Cleanses excessive mucus accumulation in congested nasal cavities and passages. Reduces excessive dryness due to dust or dry air. Formulation: Isotonic, undiluted, sterile, 100% natural-source desalinated sea water, with more than 70 trace elements and minerals naturally-occurring in sea water. Does not contain preservatives. Dosage: Gently apply hydraSense at least twice a day (morning and evening), and 4 to 6 times a day when cold or allergy symptoms are present. For 2 years of age and older.